Often called the “king of oils”, jasmine has been revered in South Asia and the Middle East for its divine scent, calming effect on the emotions, and wide range of medicinal applications. In these regions of the world, jasmine is a well-known women’s herb that is used to address menstrual pain or discomfort, encourage uterine contractions, and ease the pain of childbirth. When you consider the number of healing properties jasmine oil provides to humans, the origin of the flower’s name—yasmeen, Persian for “gift of the gods”—makes a whole lot of sense. Jasmine (Jasminum grandiflorum) is a flowering tropical vine native to South Asia, part of the wide-ranging Jasminum genus that has members in tropical regions throughout the Old World. The jasmine plant has green vines and leaves and small white flowers. Jasmine absolute oil is the only kind of oil that can be obtained from jasmine flowers: too delicate for traditional steam distillation, the compounds in jasmine must be extracted using a cold solvent such as liquid carbon dioxide. One pound of jasmine oil requires 1,000 pounds of flowers to make—equivalent to 3.6 million fresh blossoms! Despite its delicate, floral, tea-like scent and traditional associations with women, jasmine oil is called the “king of oils”. (Rose oil, from Rosa damascena, is considered the “queen of oils”.) 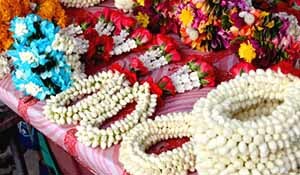 In South and Southeast Asia, women use fresh jasmine blossoms as hair ornaments, and garlands of jasmine and orchids are sold in Thailand to mark religious occasions and festivals. Garlands of fresh jasmine adorn a market stall in Thailand before a festival. In China, jasmine tea has been popular for centuries: a combination of fresh jasmine flowers and dried green or oolong tea is mixed together and allowed to steep for a few hours, until the tea leaves have absorbed the volatile compounds from the flowers. After it is refired to prevent spoilage, the jasmine flowers—now dried and odorless—are either removed or left in for decoration. Jasmine was likely brought to the Middle East by Persian traders, and from there disseminated to Europe via trade with Morocco by the 17th century, where it exploded in popularity as a perfume ingredient and even became part of a signature scent favored by King Louis the XVI of France. 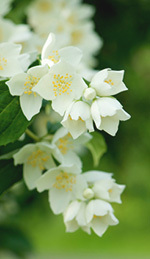 Jasmine oil has been used since antiquity as a sedative, nervine, analgesic and anti-inflammatory. The oil is believed to ease mental and emotional stress and tension while promoting feelings of calm and groundedness. Jasmine is still used by aromatherapists today to address stress-related conditions, nervousness, and anxiety, either by massage or vapor therapy. Inhaling jasmine oil can also help discharge excess mucus or nasal catarrh, while a gentle massage with jasmine oil does wonders to address dry, irritated or inflamed skin and to diminish the appearance of scars  and stretch marks. With its analgesic and anti-inflammatory effects, jasmine oil is also useful for pain, stomachaches, muscle aches, menstrual discomfort, and as a general uterine tonic . One modern-day use for jasmine oil is to assist people going through addiction treatment, since it is thought to calm the mind and center the emotions during this turbulent experience. Jasmine is also known as the “Queen of the Night”, since the flowers open only after dusk and must be picked at night to ensure maximum fragrance. Next time you take a whiff of pure jasmine oil, imagine the moon shining on fields of this night-blooming beauty as farmers pluck the flowers one by one to begin their journey from the Far East to your aromatherapy cabinet. 1. Paarakh, Sandeep and Padmaa M. Paarakh. 2009. “Jasminum grandiflorum. Linn. (Chameli): Ethnobotany, Phytochemistry and Pharmacology – A Review”. Pharmacology Online 2: 586-595. 2. Vidyalakshmi, A. and S, Esaki Selvi. 2013. “Protease activity of floral extracts of Jasminum grandiflorum L., a wound-healing herb.” Journal of Medicinal Plants Studies 4(1): 11-15. This entry was posted in Aromatherapy, Essential Oils and tagged pain relief essential oil, stress relief essential oil on January 28, 2014 by Keith Cleversley.